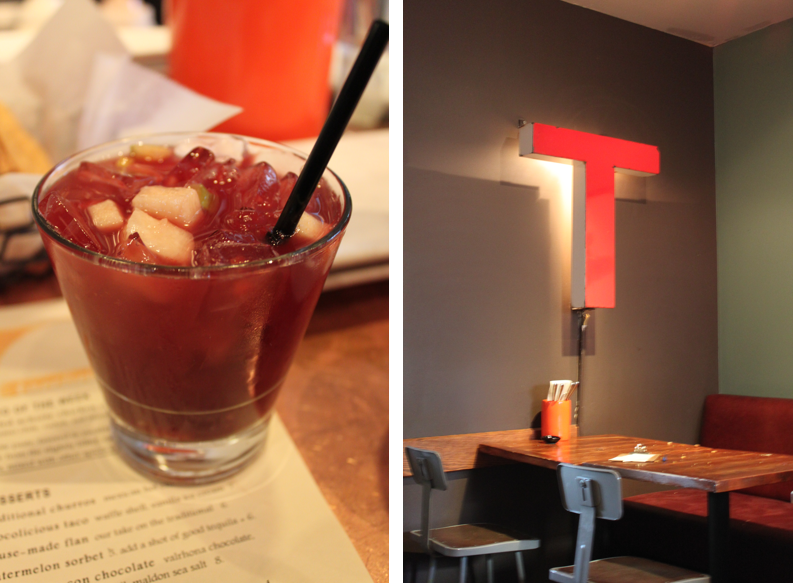 I spend a lot of time in the Marina district, but I have only recently started exploring the many cute and quaint restaurants in the area, and Tacolicious has always been one of the places on my list. So, this Thursday, after a really awesome morning and afternoon, I decided to spend the evening with my friend, Doug, for some quality taco time. True to our gluttonous nature, we were quite the ambitious ones and split a platter of ten tacos between us. Yes, TEN tacos for $29. My half consisted of two veggie tacos (made with roasted squash, zucchini, and red peppers), one chorizo-potato, one beef short rib, and one chicken taco. I washed down all five of those suckers with a refreshing sangria roja, made with red wine and fresh fruit. Juicy and delicious, Tacolicious's tacos were nothing short of filling. What I love most about Tacolicious is its laid-back and hip vibe, which happens to be the perfect place to unwind after a long day of work. But, take head, if you decide to come to Tacolicious after work, it's best to get there a little before 6:30 to beat the crowd! After stuffing ourselves silly with tacos, Doug and I took a walk along Chestnut Street, before finally deciding to get a cup of coffee. We sat outside on a bench with our warm coffees and decided to do a little people watching. It was then when we noticed a Tim Lincecum doppelganger across the street. "Look at that Lincecum look-a-like," Doug said with a laugh. I stared with my poor vision and kept my eyes on him as he crossed the street and headed towards us. As he got closer and closer, my jaw dropped, as I realized that was no doppelganger. Nope, it was the real deal. Yep, Timmy Lincecum casually strolled by us with a smile, and I sipped my coffee in awe, watching as swarms of San Franciscans gawked at our local celeb. What an ending to a fantastic day, I thought. Only in San Francisco could I feel this way. Have a wonderful weekend, lovers. Thanks for all of your amazing & sweet comments. I have some fun stuff coming up on the blog, so be sure to get the updates first by following me on Bloglovin' and Facebook! That looks so delicious.. ahhh. Mouth watering food! The food looks really nice! oooh I've been wanting to hit up that place forever- my sis just moved to the marina, and I'm planning on hanging out there a lot more! Maybe I'll run into you and Tim next time I'm there!! This looks so delicious! I need to hop on the Taco bandwagon STAT! looks soo good! might have to check this place out when i'm up in sf this summer! I wish there were local celebs around me. I should become the Midwest's local celeb. I heart tacos! ill have to try this place! Wow this has made me hungry! hehe, glad to see that you tried tacolicious out. how does it compare to nick's crispy tacos?! Yummy, these look delic! Now i'm super hungry!!!! I love reading posts about great restaurants in cities that I have or plan to travel! Ahhh these tacos look sooo delicious! oh my, this post has made me SO HUNGARY! YUM! i looove tacos!!! Hmmm Hmmm....those tacos look delicious. Ohhh SanFran! I have been there only once and I renmember strolling down the street during the Saturday Market when blocks and blocks have little tiny shops put up. I went into one of the China town stores and got a broiled WHOLE fish on a stick! OMG it was delicious. And only in San Francisco can I walk the street with a fishy-sicle. hehe.